Littlearth's Quilted Collection is the perfect bag for the astute Sports Fan. 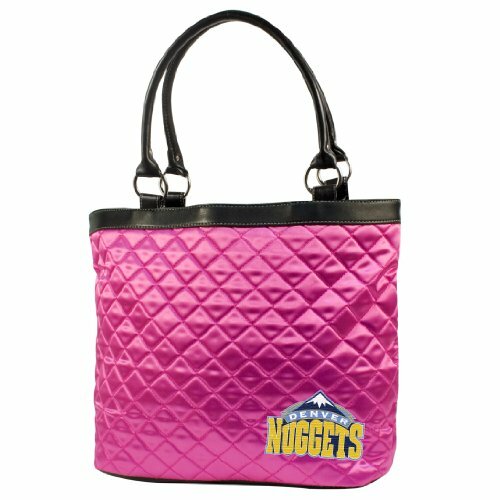 This Quilted Tote measures 16" Length x 5.5" Width x 12" Height and has an 8" Handle Drop. Trimmed in faux leather this bag features rich satin-like quilting sure to catch the eye of passersby. Displays embroidered applique of favorite team logo in bottom front right of bag. Magnetic snap closure at top of bag keeps belongings secure. Interior of bag has two side pockets to allow for easy access and organization. This beautiful bag is a must-see and is sure to be the essential accessory for the incisive fan.